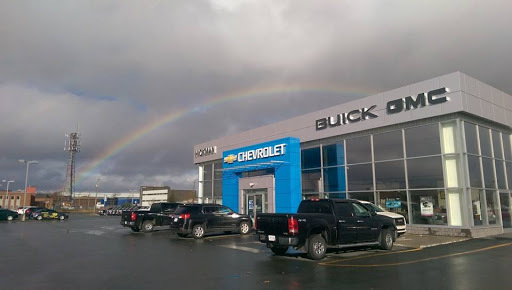 The only one we have ever gotten any satisfaction out of at Hickman motors in Gander is Maurice Goodyear. Props to him for always addressing our issues and always serving us with a smile, not to mention making buying our vehicle a breeze. As for the service department we will be taking a break from going there and well get our service and maintenance done elsewear. In the last 9 months of having our vehicle we have had one good service with decent timing. Other than that we have had nothing but issues. We have already pulled a car from there and brought it to a local garage because hickmen motors can not find out whats wrong with it. Also we have had to bring another truck (2 years old) there for the same problem to many times in the last 2-3 months.. hopefully this time the issue with that truck is resolved and we can actually drive across the island without breaking down. Just made my first big purchase at Hickman Motors, Gander - my very first and very own brand new car! The service I received at this dealership was terrific from the first minute I walked in to be greeted at the front desk. The time was taken to introduce me to many members of the dealership, all of whom offered warm welcomes and the assurance they are there to help. As a first time buyer this entire process was completely unfamiliar to me. The staff here - especially my sales consultant, Mr. Maurice Goodyear - showed me so much patience and answered every question I could think up. Any nervousness or pressure I may have been feeling about making my decision was melted away, and I left the parking lot feeling very confident and well cared for. This "first" for me could not have been a better and more comfortable experience. Stopped here on our vacation with a problem with our rig. They got right on it ... fixed the problem ... didnt suggest extra unnecessary repairs ... friendly and we were on our way the same day. Great!